A numerical and experimental investigation of the acoustic streaming flow in the near field of a circular plane ultrasonic transducer in water is performed. The experimental domain is a parallelepipedic cavity delimited by absorbing walls to avoid acoustic reflection, with a top free surface. The flow velocities are measured by particle image velocimetry, leading to well-resolved velocity profiles. The theoretical model is based on a linear acoustic propagation model, which correctly reproduces the acoustic field mapped experimentally using a hydrophone, and an acoustic force term introduced in the Navier-Stokes equations under the plane-wave assumption. Despite the complexity of the acoustic field in the near field, in particular in the vicinity of the acoustic source, a good agreement between the experimental measurements and the numerical results for the velocity field is obtained, validating our numerical approach and justifying the planar wave assumption in conditions where it is a priori far from obvious. 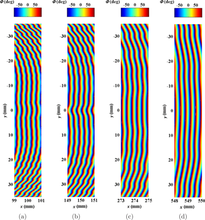 The flow structure is found to be correlated with the acoustic field shape. Indeed, the longitudinal profiles of the velocity present a wavering linked to the variations in acoustic intensity along the beam axis and transverse profiles exhibit a complex shape strongly influenced by the transverse variations of the acoustic intensity in the beam. Finally, the velocity in the jet is found to increase as the square root of the acoustic force times the distance from the origin of the jet over a major part of the cavity, after a strong short initial increase, where the velocity scales with the square of the distance from the upstream wall.